Chabill's Tire & Auto Service offers quality oil changes and auto repair services that are quick and affordable. We recommend getting your oil changed every 3,000 - 5,000 miles to stop engine wear and keep oil free of fragments. For your car's specific mileage, always consult your owner’s manual, or ask one of our professionals. Your vehicle depends on clean oil and oil filters to keep it running smoothly. Oil levels should be kept full, clean from particles, and not burnt. Oil lubricates are vital engine components. Moving parts create friction, and over time that friction wears the components down. Oil or synthetic lube can decrease the damage caused by the heat from those moving components. 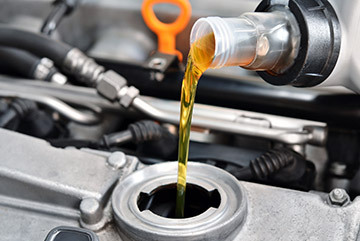 By maintaining a regular oil change schedule, you will increase your engine's efficiency as well as sustain the life of your vehicle's engine. Chabill's Tire & Auto Service provides quality oil changes and oil filter replacements at prices you can afford. Schedule an appointment for your next oil change today! We’re proud to be your local auto repair shop and provider of tires in Baton Rouge, Lafayette, Morgan City and the surrounding area.